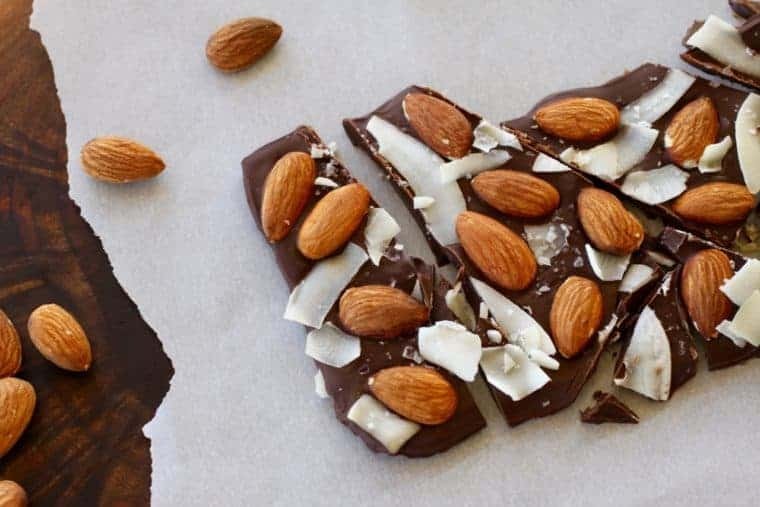 Dress dark chocolate with your favorite nuts and fruit to make Almond Studded Chocolate. I used coconut and almonds in this quick-to-fix chocolate dessert. Or what’s not to like about Almond Studded Chocolate? Dark chocolate topped with toasted nuts, fruit, a sprinkle of salt and you have a really, really good bite (or two) of chocolate. No doubt you’ve heard that dark chocolate has a health halo. I guess all that wishful thinking paid off! Dark chocolate, with at least 70 percent pure cocoa, and unsweetened cocoa (that has not undergone Dutch processing) have healthier fat composition and are rich in flavonols. Eating dark chocolate appears to benefit blood pressure, cholesterol and cognitive health. A 1-ounce square is the amount to aim for. ‘Course you could pick up some of those flavanol benefits from tea, citrus fruit, red wine, apples, berries and legumes, but it’s kind of hard to let those slowly melt in your mouth as you savor the silky creaminess. Make a tray of heavy aluminum foil. Sprinkle toppings on chocolate. Gently press the toppings onto the chocolate – make sure they touch chocolate so they stay put after you soften the chocolate. Warm in oven. That’s it. Seriously! 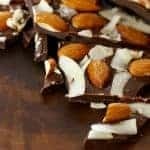 Dress dark chocolate with your favorite nuts and fruit to make Almond Studded Chocolate. 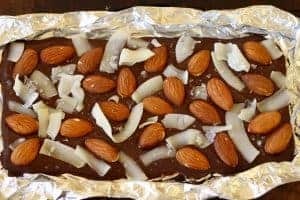 I used coconut and almonds in this quick-to-fix sweet. Place the chocolate bar on a piece of aluminum foil with 1-3 inches extra foil around each side. Pinch around the shape of bar to make a mold. 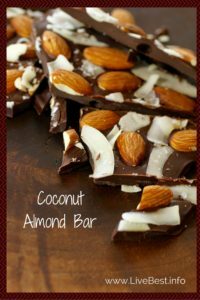 Sprinkle the almonds and coconut over the bar, making sure each piece comes in contact with the chocolate. Sprinkle with salt. Place in oven for 5 minutes until chocolate is melted. Remove and chill until hardened. Peel off foil. Dried apricots or cherries, raisins, crystallized ginger, peanuts, hazelnuts, pecans, pumpkin seeds or hazelnuts, choose your favorite combo. Check out the creative ideas the Recipe Redux food bloggers are cooking and the blogs they explored.